Wedding at the Grand Bohemian Hotel in Orlando. The sweetheart table arrangement overflowed with white Phalaenopsis orchids and willow. 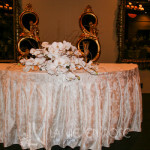 The guest tables had beautiful sprays of white and pink Dendrobium orchids.